To my mother, the woman who raised me, loved me and made sure I had the best. Now that I am a mother too, I appreciate your love and your sacrifice even more. May God bless you, and grant you a long, healthy and happy life. I miss you and I love you! Happy Mother's Day! That was the question I heard in a radio pro-marriage ad by a Catholic group this morning. Among the answers given by the many different voices in the ad were "I gave him a big, long hug this morning", "I called her at work today", and other answers I don't quite remember. I wished I could though, because they were good answers - answers that were actually little acts to show your affection for each other and actions that keep a couple's marriage strong. What have I done for my marriage today? Er, I was in a bad mood last night and using that as an excuse I gave my husband the cold shoulder. I did not even respond to the morning goodbye kiss or the "I love you". The day's not yet over, and there's still time for me to redeem myself, eh! I am thankful and blessed to be married to a man who puts up with my many selfish acts. It has been a while since he asked me if I would do it all over again, marry him, that is. Here's my answer for him today. Yes, I would. I would marry you all over again, warts and all! May 7th is National Grump Out Day. That means for 24 hours, no grumpiness, no grousing, no complaining, no swearing etc. Today was the first I heard of the existence of a Grump Out Day. I heard about it on the Paul Harvey show this morning, which came on at 8.00 a.m., and when I heard it, I had already shown my impatience with my children! Yes, so early in the morning, and I was already snapping at my children! Put that grumpiness to a lack of sleep! I still have half the day to recover my good spirits and refrain from being grumpy, eh! Yesterday I called my friend who is working in Bintangor, Sarawak. Bintangor used to be called Binatang, and because of the meaning of the word in Malay it was changed to Bintangor many years ago. The only claim to fame that Bintangor has, as far as those of us who don't live there are concerned, is that it has one of the oldest teacher training colleges in the state. I have invited this friend to join me and my family to the Gawai (harvest festival) celebrations at my parents longhouse which is located in Saratok. Saratok is not that far from Bintangor and she can easily take the bus and I will pick her up from the bus station. 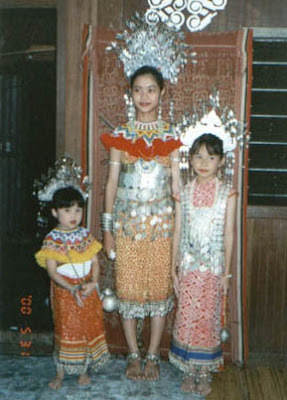 The two little girls are my nieces who took part in the beauty contest for children. I don't think this friend, who is Chinese, has ever spent the night in a longhouse before! 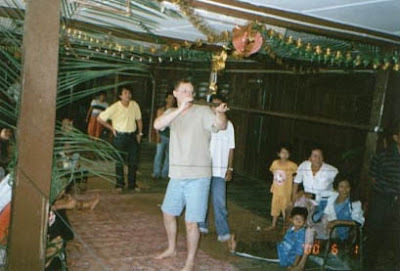 It will most certainly be quite an experience for her especially with the noise and merry making that goes on all night during the Gawai celebrations. Doug taking part in the blow pipe competition at the long house. Gawai celebrations begin on the evening of May 31. My parents and my family will drive to Saratok from Miri on May 28. It will be a long drive but at least this time, we won't be caught in a bottle neck in Durin where in the past we had to catch the ferry across the river. There's a bridge over the river at Durin now. A few days before the 31st is the busiest time on the road because many people are also making their way to their various longhouses, and the bridge will most certainly help us arrive at our destination a lot quicker. I am so looking forward to celebrating the Gawai celebrations with my kids. The last time the kids were at the longhouse, Denice had just turned one and Duncan was 10 months old. It was not a happy time for Duncan because he fell ill with a fever the day after we arrived there. Hopefully, this time around they will be stronger and able to take the changes in the weather better. Yesterday I ordered about a hundred dollars worth of products from my favorite online food supplement store to bring back to Malaysia. I ordered a bottle of borage oil for my mother to add to the two I'd ordered earlier, and the rest of the stuff was mainly for diabetic care. I want to give one of my friends, who was recently diagnosed with diabetes, something to help her better control her blood sugar, something like gymnema sylvestre and banaba. I bought a bottle each of the two products. Previously, I love to give away Vitamin C and Vitamin E to friends in Malaysia, but this time since those bottles of stuff for my mother and friend already weigh a few pounds, I think I'll skip the gift giving to the others! Hey, have you read one of my latest entries on my health blog? You should read about how diabetes could be the result of intestinal dysfunction and how diabetics who went through gastric bypass procedures had experienced remission in their diabetes! Great news! You know, all these remind me of how priceless our health is, and how we should take good care of our health because when it is gone, no amount of money is going to be able to get it back for us! I can't believe that in about two and a half weeks we'll be flying to Malaysia! I, of course, am excited about the thought of being with my parents and other family members. We'll be going to my parents' longhouse for the Gawai celebrations a few days after we arrived in Sarawak, and will be Sarawak for close to three months. Just me and the kids. Doug will return to California after two and half weeks, and come back to fetch us some time in August. What I am not looking forward to is being away too long from my computer and my blogging activities! Haha, is that a confession from a blogging addict? When we were at Disneyland about two weeks ago, we stayed at a hotel that had no wi-fi access. I brought my lap top with me, and I turned it on once. There was wi-fi access available from the neighboring hotel and even though my wireless modem intercepted the connection I couldn't get online because the connection required an access password! What a bummer! The next hotel we stayed at, there was free wi-fi access and no password required either! Wished there was a hotel like that near the hotel we stayed at while in Disneyland! I managed to post one entry on one of my blogs while in Los Angeles. And Doug was able to get a fix of his news addiction while we were staying at that hotel too. When we get to Malaysia I am thinking of getting an account with one of the cell phone companies that offers internet services. I don't really know how this works but I think Akmal has the answer to this question. I remember reading his recommendation to Daphne. I don't feel like tying up my parents' phone line to get on the internet. Of course I don't have an internet account but my brother who still lives with my parents does. Where my parents live, broadband is still not available. Considering the amount I can spend on the internet, a broadband account would have been the best deal for everyone! I toyed with the idea of getting a new laptop because the current one I have does not have a big hard drive and neither does it have a DVD writer. Doug just bought me a new desk top so .... no go with the new laptop! For now, what matters is that the old laptop still works for my blogging and internet surfing activities, right? Last week, while we were walking along Hollywood Boulevard in LA, we walked into a store that sold all kinds of things including the guitar. Duncan wanted to buy a small guitar and a small saxophone. I told him to wait till he started some music lessons before buying him some musical instruments. There was a guitar that cost only $20. Wow, so cheap! Later on Doug thought he should go back to the store and buy the guitar. After all at $20 who cares if he knew how to play it or not? Then yesterday at the flea market, I saw some really nice guitars for $45 and an electric acoustic one for about $100. I was quite tempted to get one! I know how to play the guitar a little .. just the easy songs with easy chords! I sometimes joked with Doug that I was sorry that he didn't know how to play any musical instruments! I told him I always thought that the man I married was going to be musically inclined and instead I got him! Here's Australian acoustic guitar virtuoso Tommy Emmanuel performing Angelina. The first Thursday in May is National Day of Prayer. President Harry S. Truman signed a bill proclaiming the National Day of Prayer into law on April 17, 1952. My church was open all day today for anyone who wanted to come in and pray. The National Day of Prayer also coincided with my weekly Bible Study with a group of church ladies. After our regular study we spent about 10 minutes praying together over the prayer items listed in the National Day of Prayer leaflet. Yet, we are so stubborn and resistant. we look to you to be our strength and shield. so that our hope may be renewed and our blessings be treasured.